BMW has a long history of creating (or commissioning) art cars. Heck, it practically invented the concept in the first place, back in 1975. It usually charges painters and designers to explore their creativity on its vehicles to serve as their canvas, but this time it's invited another kind of artist to design their latest. The Bavarian automaker collaborated with R&B superstar Khalid to create not just one, but an entire fleet of vehicles to ferry celebrities around at this year's Coachella Festival – all of them based on BMW's flagship i8 plug-in hybrid sports car. Drawing its design from the cover of his new album "Free Spirit,” the special livery features flames and the image of a wolf. Though not billed strictly as an official art car, it certainly fits the bill. Though Garage Italia Customs was commissioned to similarly transform an i8 a couple of years ago, BMW i vehicles have never served as the canvas for an official art car project, which have recently focused on race cars like the M3 GT2 (by Jeff Koons), M6 GTLM (by John Baldessari), and M6 GT3 (by Cao Fei). It's been two years since that last one was unveiled, so we'd say it's about time for another. And when it comes, don't be surprised to see its powertrain as electrified as its design is electrifying. 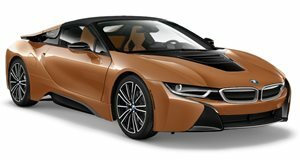 BMW increases the headroom on the most convincing hybrid sports car around.